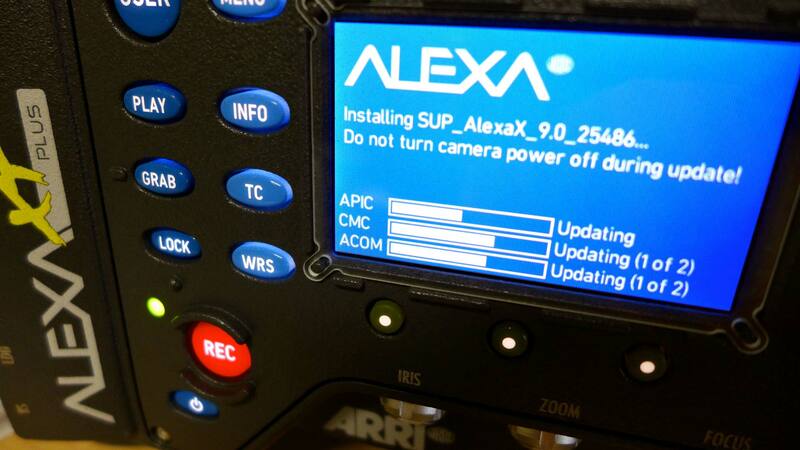 Just in time for Cyber-Monday: the new ARRI Alexa 9.0 Software Update Packet (SUP) for XT/XR and Classic cameras. New User Manual and Instructions. The 23-page Release Notes provide a comprehensive and nicely illustrated overview. In Open Gate sensor mode, the active pixel area is 28.17 x 18.13 mm, 3414 x 2198 photo sites, an image circle of 33.5 mm, and an aspect ratio of 1.55:1. This larger area can be helpful for repo, resizing, digital stabilization, rotating, or native 3.4K VFX. To enable Open Gate on cameras delivered before November 2013, sensor calibration must be done by an ARRI Service Center. Most cameras delivered after November 2013 have this calibration already included. In the System menu, select Sensor. Select Sensor mode and select Open Gate. Press the jogwheel to select Open Gate sensor mode. Press the LOAD buttons simultaneously to load the new sensor mode. Loading takes about 30 seconds including a mandatory camera reboot. A progress bar indicates the sensor mode loading progress. “Ready when you are, CB.” For all those unpredictable moments especially well-known to wildlife documentarians, SUP 9.0 includes ProRes pre-recording for all Alexa cameras. When you push the REC button the first time, the camera continuously captures images, audio and metadata into a temporary ring buffer. When the REC button is pushed a second time, the camera keeps everything in the buffer and then continues to record from there. Buffer duration depends on buffer size selected, codec and frame rate. Those few precious buffered seconds of that angry rhino charging can save the shot, as you prepare to save yourself. 120 fps in ProRes 4444 in 16:9 HD mode. (Requires Alexa XT cameras or Classic cameras with XR Module upgrade and XR Capture Drives or CFast 2.0 cards. 10-bit DNxHD 444 for cameras with DNxHD license. Up to 30 fps on 32 GB SxS PRO cards and up to 60 fps on 64GB SxS PRO cards, CFast 2.0 cards or XR Capture Drives. Support for the Cooke /i metadata, as well as ARRI LDS (already in Alexa XT/XR cameras) now available for Alexa Classic cameras with a PL-LDS mount. XT andClassic cameras with the XR upgrade can use the new CFast 2.0 Adapter to record to CFast 2.0 cards up to 120 fps ProRes 4444. The upcoming Amira also uses CFast 2.0.